Photo challenge: something eerie has a story to tell, one you aren’t quite sure you want to know. Dani mummy – Jiwika, West Papua, Indonesia. I could hear the bawling camels and the screeching mummy. So, your proverb speaks of the Sounds of Silence? This is definitely eerie. And you notice that when you read the sentence “something eerie has a story to tell, one you aren’t quite sure you want to know”… Where was it? Well done! Obrigado, Thatiana! 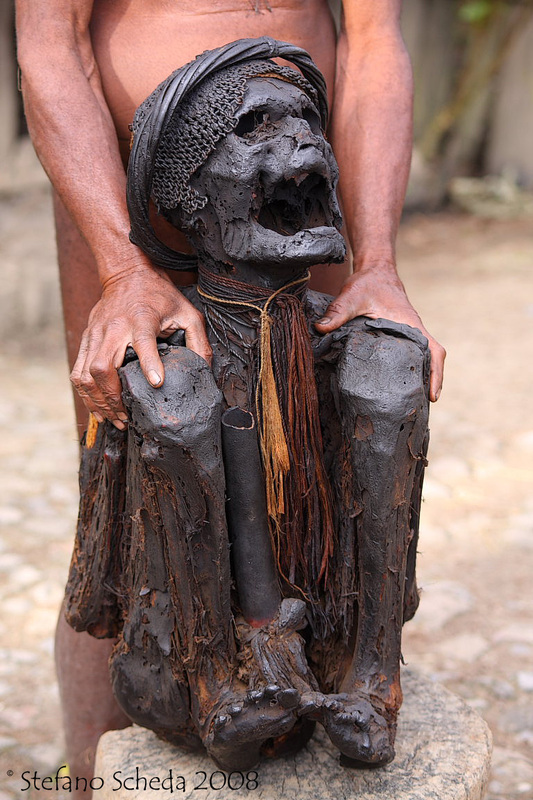 The mummy is in a small village near Wamena in West Papua, the indonesian part of New Guinea. It’s an old village chief; it’s stored in a special hut over the fireplace and it’s conserved by fire smoke. Hi Merilee. Thanks for stopping by. Genial!!!! And conserved by fire smoke!!! i am sure there is something behind, because seems like it is crying for the whole world during the whole eternitity!! Or moments of eternal bliss: Listen to the bawling of the camels, the liberated screeches of the mummies. Excellent, Just yesterday, a neighbor and I agreed we never wanted to go to heaven, because we had no friends who would be there. No problem in hell. However, you suggest even a better destination: Purgatory. Lekker. Yes, Amaya. And looking into those empty eyes and mouth was somewhat disturbing. Thank you, Janet. Anyway mine is rather “black”. Good choice for the eerie theme! Stefano, I think you win the “eeriest photo” award this time around! Yikes!!! Thanks you, Tina, although that wouldn’t be my favorite award. I think I agree with Tina! Your photo made me feel very odd, a chill through my whole body and slightly nauseous. Isn’t it amazing what a picture can do!! Great photo even if quite weird and creepy! What could be more eerie than this? The open mouth, the cry out from this empty mouth…Uh, hope I will not get nightmares from it. Well chosen for the challenge. What makes this photo especailly powerful is the gesture of the man holding the mummy’s knees – wow. You have been able to capture so many amazing moments – you must have a good way with people, Stefano! At such an intense moment, who knows what was going on unconcsiously? And anyway, there are always unexpected elements in photography, aren’t there?